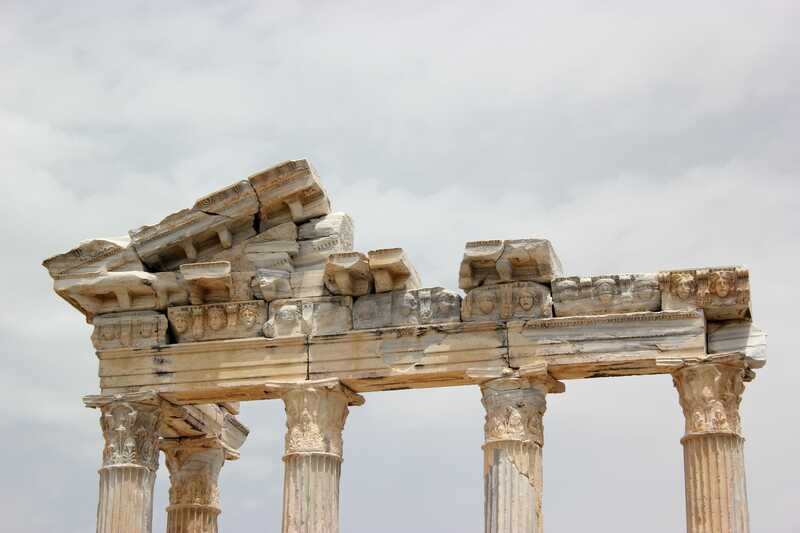 GED Blog » Fostering Economic Integration Through International Trade & Investment » Ten Years After – Where Is the Greek Economy? The outbreak of the global financial and economic crisis plunged in particular the southern European economies into a deep recession. Brexit, Trump and geopolitical crises such as the North Korea conflict have caused the economic problems in southern Europe to recede into the background. However, these problems have not been resolved by any means. The economic situation is bad, particularly in Greece. The European Central Bank and the International Monetary Fund are concerned about Greece’s borrowing power. Nonetheless, there are a few bright spots. The main indicator for a country’s economic development is its gross domestic product (GDP). 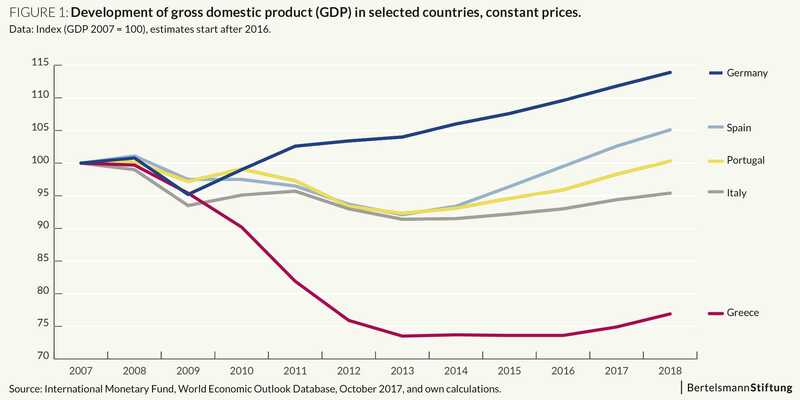 A glance at the development of Greek GDP in comparison to the other three southern European crisis countries (Italy, Spain, Portugal) and Germany shows that Greece’s economy has developed much worse than the economies of the other mentioned countries since 2007 (the year before the beginning of the crisis and the bankruptcy of Lehman Brothers). To facilitate a better international comparison over time, real (i.e. inflation-adjusted) GDP in 2007 has been standardized to 100 percent in each country (see Fig. 1): Italy, Spain and Portugal more or less returned to their 2007 GDP level in 2017, according to preliminary estimates by the International Monetary Fund (IMF). In Greece, by contrast, GDP was at just 75 percent of the level in 2017. A drop in GDP is usually accompanied by a decline in employment. 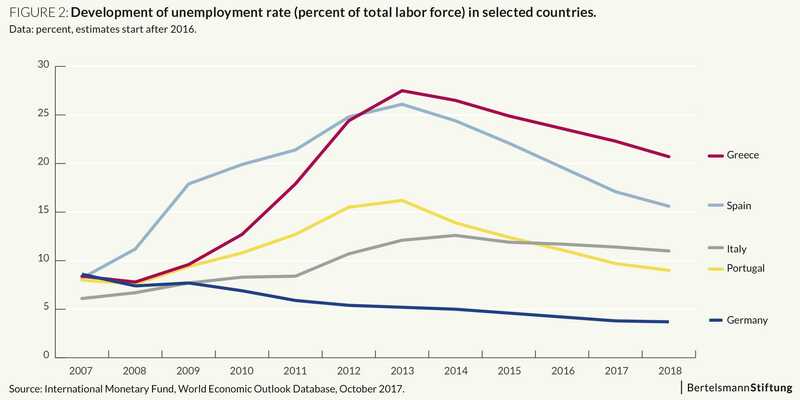 During the global financial and economic crisis, unemployment rose in all southern European crisis countries (see Fig. 2). However, it rose especially sharply in Greece: In 2013 and 2014, unemployment was above 25 percent. By 2017, it had declined only slightly and was still a little above 22 percent. This is the highest level of unemployment in all four southern European economies. One reason for Greece’s decline in economic activity is the low level of investment. 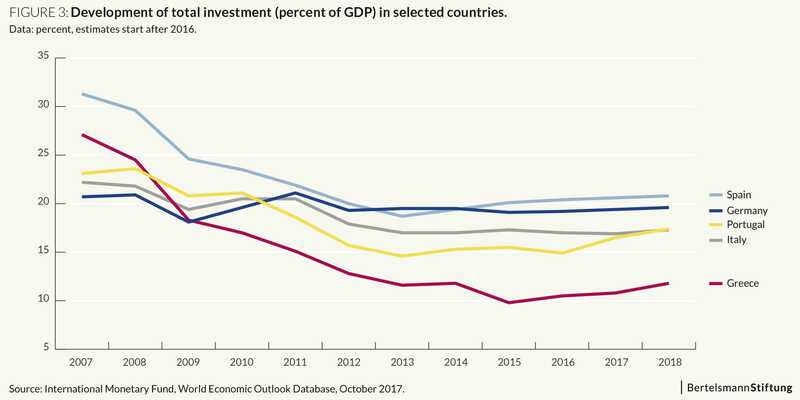 Macroeconomic investments are reflected as a percent of GDP for international comparisons. The investment rate for Greece defined in this way fell from 27 percent in 2007 to just under 11 percent in 2017 (see Fig. 3). The decline in the investment rate by 16 percentage points is the largest decline by far in the four southern European economies. The level of investment achieved is also significantly lower than in Italy, Spain and Portugal. The austerity program required by international creditors reduces government demand for goods and services. When Greek companies adapt to this lower demand, then output, GDP and employment decline. The decline in employment reduces the disposable income of private households. This means that private consumption drops. Falling wages, pensions and government social benefits have the same effect. The result is a further decline in output, GDP and employment. Uncertainty about Greece’s economic future, the credit rating of the Greek state and the Greek government’s (economic) policy has a negative impact on companies’ willingness to invest. The decline in demand for capital goods (mainly machinery and buildings) causes a further decline in macroeconomic demand, which in turn has a negative impact on output, GDP and employment. The competitiveness of the Greek economy is low in comparison to other countries. An important indicator for measuring the competitiveness of economies is the “Global Competitive Index“. 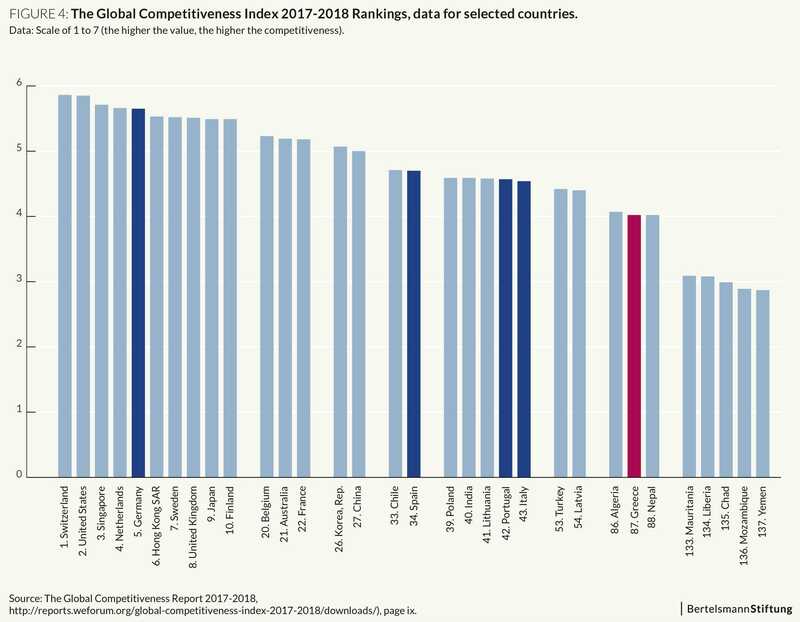 A glance at the current “Global Competitive Report 2017-2018” shows that Greece’s performance is very poor in comparison to other European countries: Greece is ranked in only 87th place out of a total of 137 listed countries. In Europe, only Bosnia and Herzegovina in 103rd place is worse. Italy and Portugal are more than 40 places ahead of Greece, while Spain is even more than 50 places ahead of it (see Fig. 4). Greece has continued to suffer from the economic collapse that began with the bankruptcy of Lehman Brothers and from the consequences of the harsh austerity policies. Nonetheless, the recession seems to have bottomed out. According to IMF estimates, Greek GDP is expected to grow slightly again in 2017 and 2018. The Greek investment rate has also been slowly rising since 2015. Nonetheless, the fragile economic recovery is extremely unstable. In addition to low international competitiveness, the high level of debt in particular is a major burden on the Greek economy. If, for example, the sovereign debt crisis flares up again, this could quickly lead to another economic downturn.